Super K is our number one pick for Curly-leaf pondweed control. We also recommend it for large leaf type submerged weeds that can be difficult to control. 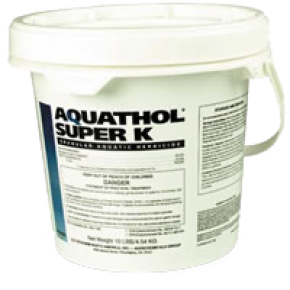 Aquathol Super K is very safe for fish. Apply with a hand scoop or hand held spreader. This concentrate goes a long way in its easy-to-use 10 Lb container. Submerged weeds Rates vary depending upon depth and plant types. Dose requirements are less for whole waterbody treatments like a pond. Water Use Restrictions: None on Swimming or Fishing. *None on Established Turf. 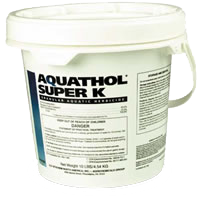 The Aquathol Super K Product Label is available for download in pdf.